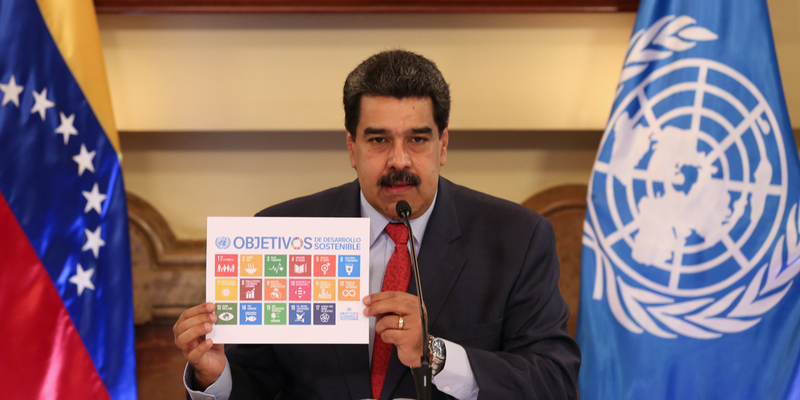 The Plan de la Patria for the period 2019-2025, a government program for the next six years which will be presented next Monday before the National Constituent Assembly (ANC), includes the 17 objectives of the 2030 agenda for Sustainable Development, reported this Saturday the President of the Republic, Nicolás Maduro. “I have included in the Plan de la Patria 2019-2025 all the objectives, policies and actions agreed by the United Nations (UN) in the 2030 Agenda”, said the Head of State. Maduro said that Venezuela has adhered itself to this Agenda because “it demonstrates a great strategic quality, vision and world experience to address the issues of humanity and take them to a higher stage of economic, social development, stability, happiness and prosperity”, with a vision to consolidate a world with more equality. “This is what is called a multilateral agenda, which for us is the expression of the pluripolar, multipolar, equilibrium world. The 193 countries of the UN agreeing common goals and policies to address the development issues of humanity”, he said. The dignitary noted that the country has already made progress in some of the objectives, such as the issue of education and the construction of sustainable cities and communities, as well as decent work and economic growth – the eighth objective of Development – through the Economic Recovery, Growth and Prosperity Program, and urged to accentuate the work on pending issues.